Gerhard Richter’s abstract emissions from the mid 1960ies to the current day with a well-balanced mix of prominent works but also artefacts from private collections and some pieces that have been undug and see the light of the public for the first day around. It is interesting to explore how the book weaves its way from Richter’s first experiments with paintings, which consisted merely of grids or prime coloured squares and rectangles, via his grey and colour chart paintings, and sculptures to enlarged photographed patterns depicting what was dried on canvas after he let go of control, which is one of the methods that is dominant specifically in his abstract body of work. After perusing the book I got a real sense of the richness of the material that was used and how imperfections become welcome features, adding another dimension and “je ne sais quoi” factor to the artworks that is nearly impossible to replicate without losing its authenticity and magic. 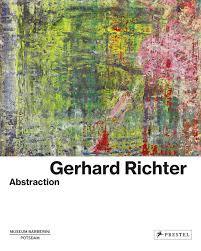 Now, if you are not familiar with Gerhard Richter and his oeuvre at large I’d probably recommend approaching him via a more mainstream take on his art, as the abstract aspect is only a mere half of what made him as an artist. For the initiated enthusiasts, this book holds merit as it shows unreleased works and makes connections that are rarely highlighted in other releases on this subject, starting with the trajectory from Richter starting out as a realistic painter to the evolution of an abstract, experimental visionary, who never stopped questioning the status quo of painting, trends and the motivations behind it all – with his internal discourse taking the centre stage.